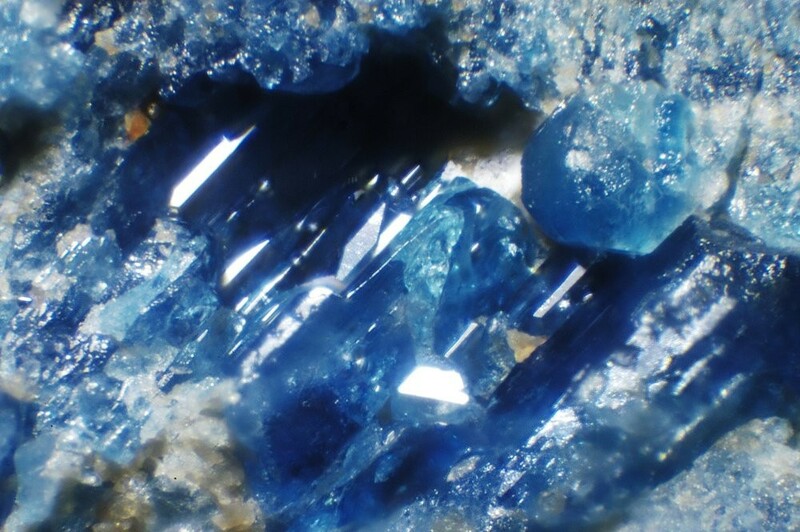 Scorzalite: Mineral information, data and localities. Named in 1949 by William Thomas Pecora and Joseph John Fahey in honor of Brazilian mineralogist, Evaristo Penna Scorza [August 20, 1899 Lavras, Minas Gerais, Brazil - March 29, 1969 Brazil]. Scorza was a field geologist, as well as an administrator later in his career. He published on a wide range of geological topics although many of his research papers were mineralogical. Lazulite Group. Lazulite-Scorzalite Series. The Fe2+ analogue of Lazulite. 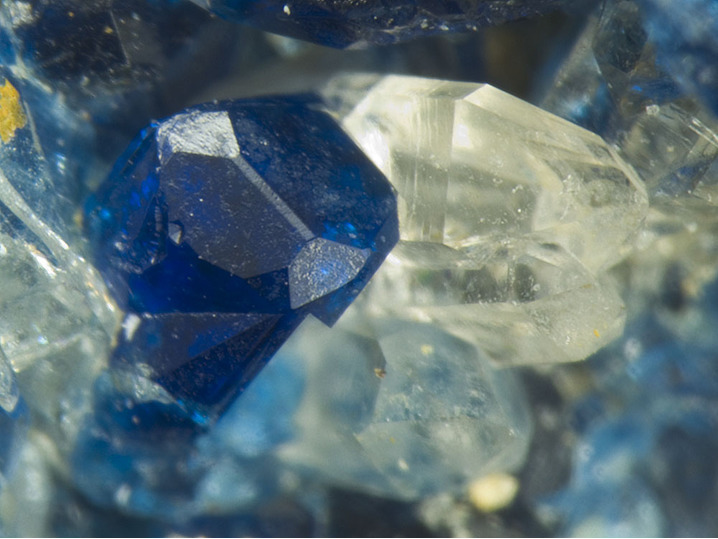 Visit gemdat.org for gemological information about Scorzalite. Generally massive, rare crystals are dipyramidal. Corrego Frio Pegmatite, Minas Gerais, Brazil. 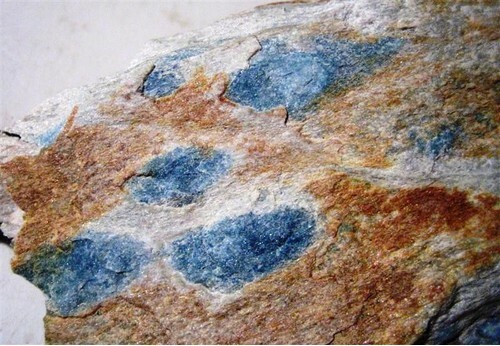 X-ray pattern nearly identical to lazulite. Quartz 76 photos of Scorzalite associated with Quartz on mindat.org. Rutile 7 photos of Scorzalite associated with Rutile on mindat.org. Kyanite 7 photos of Scorzalite associated with Kyanite on mindat.org. Berlinite 5 photos of Scorzalite associated with Berlinite on mindat.org. Augelite 4 photos of Scorzalite associated with Augelite on mindat.org. Trolleite 3 photos of Scorzalite associated with Trolleite on mindat.org. Lazulite 3 photos of Scorzalite associated with Lazulite on mindat.org. Gatumbaite 3 photos of Scorzalite associated with Gatumbaite on mindat.org. Montebrasite 3 photos of Scorzalite associated with Montebrasite on mindat.org. Brazilianite 2 photos of Scorzalite associated with Brazilianite on mindat.org. Pecora, W.T. and Fahey, J.J. (1949) The Corrego Frio pegmatite, Minas Gerais: Scorzalite and souzalite, two new phosphate minerals. American Mineralogist: 34: 83-93. American Mineralogist (1949): 34: 685-687. Pecora, W.T. and Fahey, J.J. (1950) The lazulite-scorzalite isomorphous series. American Mineralogist: 35: 1-18. Palache, C., Berman, H., & Frondel, C. (1951), The System of Mineralogy of James Dwight Dana and Edward Salisbury Dana, Yale University 1837-1892, Volume II. John Wiley and Sons, Inc., New York, 7th edition, revised and enlarged, 1124 pp. : 908-911. Journal of the Mineral Society of Japan (1980): 14: 285. Anthony, J.W., Bideaux, R.A., Bladh, K.W., and Nichols, M.C. (2000) Handbook of Mineralogy, Volume IV. Arsenates, Phosphates, Vanadates. Mineral Data Publishing, Tucson, AZ, 680pp. : 532. The following Scorzalite specimens are currently listed for sale on minfind.com. Eagle, R.M., Birch, W.D., McKnight, S. (2015) Phosphate minerals in granitic pegmatites from the Mount Wills District, north-eastern Victoria. Proceedings of The Royal Society of Victoria, 127:2, 55-68. Eagle, R.M., Birch, W.D., McKnight, S. (2017) Corrigendum to: Phosphate minerals in granitic pegmatites from the Mount Wills District, north-eastern Victoria. Proceedings of The Royal Society of Victoria, 129, 53. Franz, G., Morteani, G., Gerdes, A., & Rhede, D. (2014). Ages of protolith and Neoproterozoic metamorphism of Al-P-bearing quartzites of the Veredas formation (Northern Espinhaco, Brazil): LA-ICP-MS age determinations on relict and recrystallized zircon and geodynamic consequences. Precambrian Research, 250, 6-26. American Mineralogist (1948): 33: 205; Mineralogical Record: 14: 233. Rao, C., Wang, R. C., Hatert, F., & Baijot, M. (2014). Hydrothermal transformations of triphylite from the Nanping No. 31 pegmatite dyke, southeastern China. European Journal of Mineralogy, 26(1), 179-188. Jambor, J.L. and Roberts, A.C. (2001) New mineral names. American Mineralogist: 86: 197-200.; Izbrodin, I.A., Ripp, G.S., and Karmanov, N.S. (2009) Phosphate and sulfate-phosphate mineralization in sillimanite-bearing rocks at the Kyakhta deposit, western Transbaikal region. Geology of Ore Deposits: 51(7): 617-626. Daltry, V.D.C. and von Knorring, O. (1998) Type-mineralogy of Rwanda with particular reference to the Buranga pegmatite. Geologica Belgica: 1: 9-15.; Anthony, Bideaux, Bladh, Nichols: Handbook of Mineralogy, Vol. IV. Fransolet, Andre-Mathieu, 1989, The Problem of Na-Li Substitution in Primary Li-Al Phosphates: New Data on Lacroixite, a Relatively Widespread Mineral, Canadian Mineralogist, v. 27, p. 211-217. F. Hatert, P. Lefèvre, A.M. Fransolet, M.R. Spirlet, F. Fontan, P. Keller : "Ferrorosemaryite, NaFe2+Fe3+Al(PO4)3, a new phosphate mineral from the Rubindi pegmatite, Rwanda", Bull. Liaison S.F.M.C., Vol. 16, 2004, pp 44-45.; Lefèvre, P., Fransolet, A. M., Fontan, F., & Keller, P. Petrographic study of the Al-rich phosphate mineral associations of the Rubindi-Kabilizi pegmatite, Gatumba area, Rwanda. Henriques, Å. (1956): An iron-rich scorzalite from Hållsjöberget (Horrsjöberget), Sweden. Arkiv för Mineralogi og Geologi 2 (3): 127-131.; Ek, Roland & Nysten, Per (1990): Phosphate mineralogy of the Hålsjöberg and Hökensås kyanite deposits. Geologiska Föreningens I Stockholm. Förhandlingar, Stockholm: 112: 9-18. Ek, R., & Nysten, P. (1990). Phosphate mineralogy of the Hålsjöberg and Hökensås kyanite deposits. GFF, 112(1), 9-18. Stalder, H. A., Wagner, A., Graeser, S. and Stuker, P. (1998): "Mineralienlexikon der Schweiz", Wepf (Basel), p. 252. Pemberton, H. Earl (1983), Minerals of California; Van Nostrand Reinholt Press: 310.
ⓘ Unspecified Phosphate occurrence (1) ? Smerud, Sara K. & Wm. H. McDonald (1956), Scorzalite and lazulite: Gems & Minerals, No. 224: 20-21, 86, May, 1956: 20; Murdoch, Joseph & Robert W. Webb (1966), Minerals of California, Centennial Volume (1866-1966): California Division Mines & Geology Bulletin 189: 333. Gross, E.B. and Parwel, A. (1968) Rutile mineralization at the White Mountain andalusite deposit, California. Arkiv för Mineralogie och Geologi 4, No. 29: 493-497; Sinkankas, J. (1976) Gemstones of North America II. Van Nostrand Reinhold Co., New York: 256; Wise, W. S. (1977): Mineralogy of the Champion mine White Mountains, California. Mineralogical Record 8, 480, 484-485; Pemberton, H. Earl (1983), Minerals of California; Van Nostrand Reinholt Press: 311. Murdoch, Joseph & Robert W. Webb (1966), Minerals of California, Centennial Volume (1866-1966): California Division Mines & Geology Bulletin 189: 333.
ⓘ Rock Landing Quarry (Capt. Rohrback Quarry) ? Whitmore & Lawrence, 2004: The Pegmatite Mines Known As Palermo, p.96. Palache, C., Berman, H., & Frondel, C. (1951), The System of Mineralogy of James Dwight Dana and Edward Salisbury Dana, Yale University 1837-1892, Volume II: 911; Rocks & Minerals (2000): 75(3): 156-169.